Dr. Bimal Kumar Sarkar, born January 2, 1961, in Kolkata, India, graduated in physics at Jadavpur University and electrical engineering at Institute of Engineers (India). He did his Ph.D. on the topic Photoacoustic Spectroscopic Estimation of Thermal and Optical Properties of Solids at Indian Association for the Cultivation of Science, India. He pursued a postdoctoral fellowship at the Department of Chemistry, National Sun Yat-sen University, Taiwan. Afterward he visited in research positions at NSYSU, Taiwan, Czech Technical University, Slovak Technical University etc. 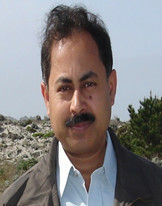 Now he is a Professor in Physics at Galgotias University, India with activity in research and teaching. At present, he is involved in the field of Computational Materials and Computational Biology. His research interest is ab initio study of the structural, lattice dynamics, electronic, elastic, thermodynamic, optical properties of solids. First-principles calculations based on density functional theory (DFT) are performed to study the structural and electronic properties of solids. Also he is doing computational work based on information theory for the investigation of network architecture of genome controlled signal transduction circuit. In March 2013 he had 80 articles published in international peer reviewed journals and conference proceedings.